One of the stressors that I did not anticipate as a school administrator was fundraising and all of its headaches and risks. We have all heard about or witnessed employees who have lost the trust of their colleagues due to missing money. In some cases, there have been severe consequences: lost jobs, revoked professional licenses and sometimes sent to jail. No community or institution is immune to the risk. 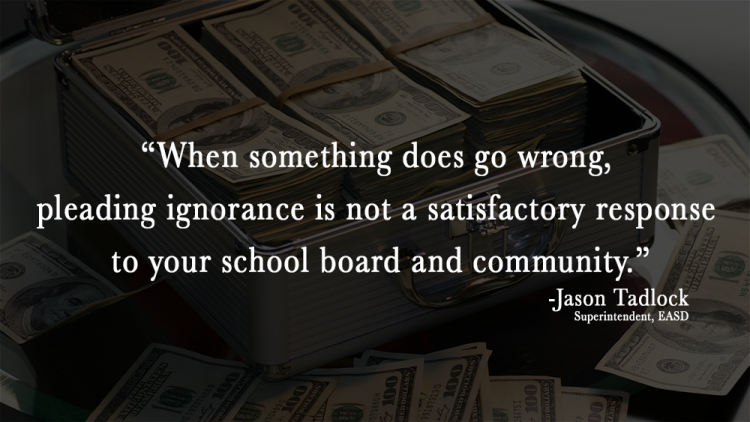 When something does go wrong, pleading ignorance is not a satisfactory response to your school board and community. This is viewed as incompetence and negligence. I have seen school administrators lose the confidence and trust of their community as a result of another individual’s poor choices. While fundraising efforts in K-12 school districts may not be a significant portion of the overall budget, the dollar amounts raised can be shockingly high. In some instances PTAs have raised over $2,000 per student in one school year. If you don’t know the total amount of dollars your school district raises on annual basis, take a moment to speak with your business manager and find out. I was surprised to learn that in our relatively small school district we raise well over $200,000 a year. Often these fundraisers involve many people handling lots of cash and thus potential fraud, lost money, or misappropriation of funds. In the past, K-12 school systems have lacked tools and resources to manage fundraising. With the tech boom more tools have popped up, but many of them are third party managed and controlled and don’t give direct oversight to the local school district. Over two years ago I was approached by a small startup named Classmunity. They were based out of the UW-Whitewater Innovation Center, and they were working to develop a solution that would assist K-12 schools in getting a better handle on school fundraising. I leapt at the idea and have assisted in the development of a tool that meets the needs of K-12 school districts. Throughout this process I have had the pleasure to learn from many other administrators and my own team about the greatest vulnerabilities that exist in school fundraising. The following is a list of what I consider to be the greatest vulnerabilities. As a school official you need to be aware of these and have a solution to address them. 1. Are you aware of what fundraisers exist, who is fundraising, and what the fundraisers support? Many district level administrators are unaware of all the fundraisers going on in their community. Too many fundraisers can lead to supporter fatigue, or even community anger if the fundraisers are not aligned with an appropriate need. 2. Do the fundraisers align with your district’s mission and vision? Most fundraisers are well intended, but the creator of the fundraiser may not have the awareness needed to be sensitive to the district’s overarching mission and/or vision. For example we recently passed a referendum in our school district to create a new practice facility. One of our sports teams wanted to do a fundraiser to equip the facility. The way it was presented it would have generated concerns and questions over why we were fundraising for a project for which we had just passed a referendum. Thanks to Classmunity we were able to identify the problems and make changes prior to launching to ensure it better aligned with program and school needs. 3. Is the fundraiser set up as a school district fundraiser, with funds being deposited into a district account? Surprisingly you may have staff raising money through independent sites such as gofundme that have the monies being deposited directly into their personal bank accounts. If that is the case, is it really a school district fundraiser? Go to gofundme.com and search your community. I bet you will find some fundraisers from you staff that you were not aware of. 4. How are payments being accepted, are students or staff responsible for large amounts of cash? How comfortable are you with students walking around door to door with hundreds of dollars in cash? How about staff holding on to thousands of dollars of cash? I know as a teacher/coach I was never comfortable with it. I was always worried about losing the money or having it stolen. Eliminating cash payments can removes most fundraising fraud. Most fraud cases start with someone skimming just a little off the top of the cash. Sometimes this snow balls to the point where thousands is lost and lives are ruined. Classmunty has given us a manner in which we can shift to online timely payments that directly deposit into our school bank accounts. Thus eliminating concerns with cash and potential fraud. 5. Are you able to effectively collect donor data, provide receipts, and build a pool of supporters? Universities and other not for profit agencies do a great job of collecting donor databases and identifying potential and recurring supporters. Most districts make no attempt to do so. How much time and efforts could be saved, or made to be more effective if you were to collect and save such information? 6. How much of the monies raised are retained by the schools? Many fundraisers still involve products. It may be discount cards, food, or crafts such as wreaths and candles. Whatever the fundraiser may be, one needs to look at how much of the money stays with the school? Are the items valuable commodities that they may have purchased anyway, such as script cards? In those cases returns are typically around 10-15%, but people may not get fundraiser fatigue because it is related to their day to day life and something they needed. However, if we stray into product sales of overpriced items we need to be cognizant that people grow tired of such sales and profit margins must be much greater. Be sure to check on the margins, and decide whether or not you’d be better off creating a unique idea on your own that will allow you to retain the fundraising dollars. There are many more vulnerabilities related to fundraising beyond what are listed here. Every administrator should have a process to reduce the risk associated with fundraising. While no process or tool can ever guarantee that fraud, mistakes, or misuse of funds will be eliminated, there is much you can do to protect your district. In our district, we use Classmunity to help combat these vulnerabilities and demonstrate to the school board and the community that they are taking the protection of these funds seriously. If you’re interested in learning more, you might find my article about how you can update your district’s policy helpful.